Markdown support is one of our favourite features in Swipe – it lets you make beautiful presentations with text and text only. It makes your slides better by focusing only on what is necessary and lets you make them much quicker. 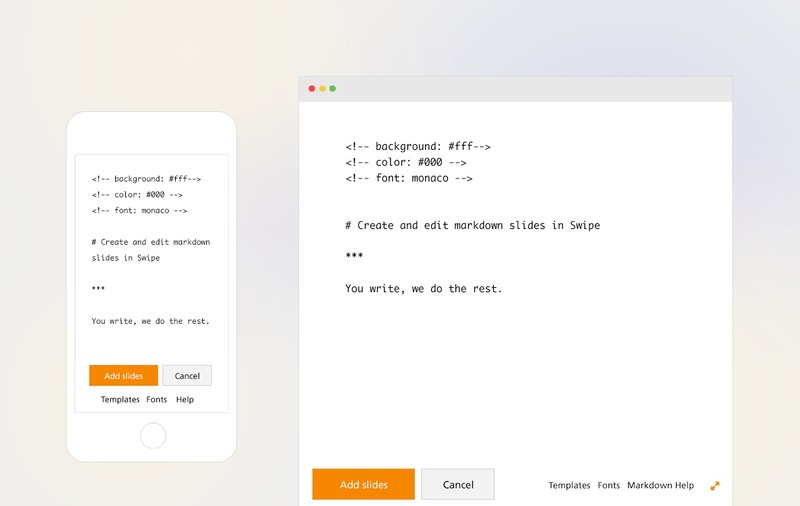 Thousands of people have already created Markdown slides in Swipe and they sent us a tremendous amount of feedback. Most people, us included, were missing a simple way of editing and creating slides without leaving the browser. Today, we are making that a part of Swipe and are announcing our very own Markdown text editor. To give it a go, find the “Markdown +” option in the “Content” section in the left sidebar on one of your existing decks. A beautiful text editor will take over, offering a few handy tips on how to create great-looking decks. You can also go full-screen for an even cleaner writing experience. Create one slide at a time or separate your slides with three stars, * * *, and we’ll take care of the rest. The Markdown editor in Swipe lets you change the design on the fly using our simple HTML commands. Play with the colours and fonts in real-time; pick one of our templates, paste it into the editor, and watch the design change as you type. It works on any device with a modern web browser. 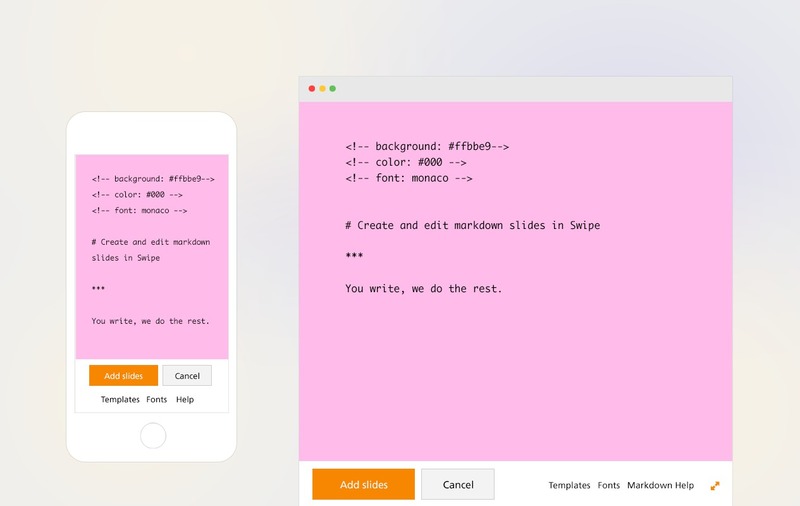 Whether you need to change a few typos on your phone, or design a beautiful pitch on a tablet, our new Markdown editor lets you do just that without worrying about text editors and file support. People keep surprising us with new, clever ways of using it. You can see some of our favourites here. Avid users of Markdown ourselves, this is the text editor we’ve always wanted and are really excited to have it in Swipe. It is the quickest way to create beautiful slides that, combined with other web content, are truly native to the web. We can’t wait to show you what we have planned for it. Get writing and let us know what you think of the new additions. Announcing Polls in Swipe - make your decks interactive and learn more about your audience in a simple and beautiful way.